Earth is overcrowded and polluted. A new planet, Exilon 5, has been located. But Exilon 5 is already occupied. Becoming Human is the first book in this post-apocalyptic dystopian series. Read the books in order: Becoming Human, Altered Reality, Crimson Dawn. In 2163, a polluted and overcrowded Earth forces humans to search for a new home. But the exoplanet they target, Exilon 5, is occupied. Having already begun a massive relocation programme, the World Government on Earth sends Bill Taggart to monitor the threat level of the Indigenes, the alien race that lives on Exilon 5. Bill is a man on the edge. He believes the Indigenes killed his wife, but he doesn’t know why. Until now. Stephen has every reason to despise the humans and their attempts to colonise his planet. To protect his species from further harm, he must go against his very nature and become human. Laura O’Halloran is losing her daily battle with Seasonal Affective Disorder. Her only chance at recovery is leaving the dark Earth for the sunnier climate of Exilon 5. She hopes her credentials as a World Government employee will secure her a one-way trip, but with the ever increasing relocation demand that is not a guarantee. Her discovery of a deadly secret threatens her life and that of Bill and Stephen. A secret so great it could rip apart both worlds. A stellar five star read! Becoming Human is an Amazon science fiction bestseller and book one in this adult dystopian series. 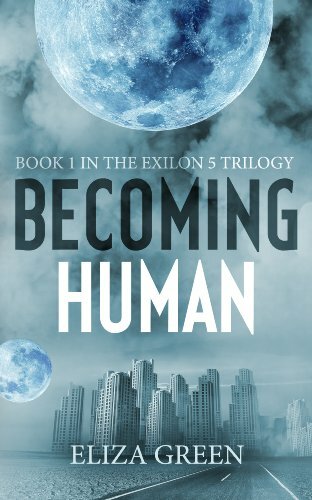 This is the Kindle version of Becoming Human: A Dystopian Post Apocalyptic Novel (Exilon 5 Book 1) that you can also download and read on your computer and mobile phone. Kindle books are DRM protected and therefore, unlike ebooks that are in PDF or ePUB format, you cannot read this ebook without the official Kindle apps.